I saw this one solely because the time was convenient and I knew nothing about it! In fact, without my readers on, I couldn’t quite tell from the poster who starred. Fortunately, it had Leslie Mann, who dolls up nearly everything she’s in, particularly The Other Woman. 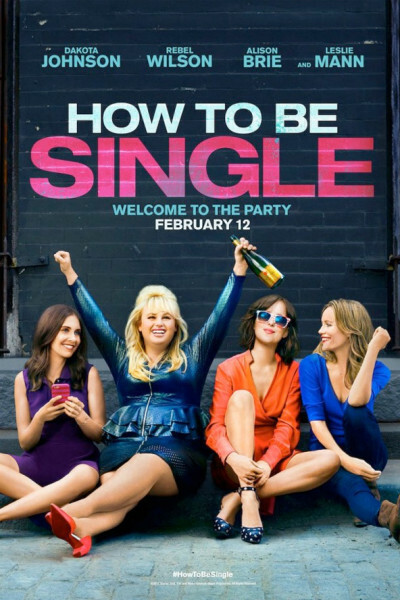 How to Be Single, however, is very ho-hum. The target demographic appears to be women with wine, as I believe I was the only man in a theater of perhaps eighty gals who were both loud and proud to be out for Ladies' Nite. The film felt way too Carrie Bradshaw for my taste(s), with two or three funny lines surrounding alleged fortune cookie wisdom, but primarily striking me as an homage to loss and loneliness. Dakota Johnson does not harm herself here, which seems like progress for a budding career that began on shifting sand. Alison Brie continues her character from Mad Men and Community. Nicholas Braun and Anders Holm play louses (lice? ), precisely as Holm did in The Intern. Jake Lacy, picking up where he left off in Love the Coopers, is a goofy, adorable, jock-like man-thing, something equivalent to Bonanza’s Hoss. Jason Mantzoukas approaches funny, but tries too hard and falls short. Colin Jost’s teeth make an appearance, pearly, plentiful and proud, as always. And Rebel Wilson, playing the same character from Pitch Perfect, Bridesmaids, and Night at the Museum is running perilously near pigeon-holing herself as a one-speed lawnmower. “I’m the funny fatty,” she remarked recently, and if she’s not careful she’ll wind up at the bottom of a rabbit hole from which her career cannot escape alive. She strikes me as quite talented, but she—like Melissa McCarthy—must remain vigilant, always guarding against being typecast as one-trick ponies (like Chris Farley). Each can achieve this best, one supposes, by diversifying (like Jonah Hill), and posthaste. Story-wise, here's my chief complaint: it's exceedingly circular and repetitive, à la Groundhog Day (which, to be clear, is a far superior film). We find ourselves at five or six separate Happy Hours, in particular, and I felt woefully disconnected from those years and that drama onscreen. It really does seem to go on and on and on, finally ending in a Wild sort of way, which is telegraphed so loudly early on that you'll come to see it as the only possible light at the end of the tunnel but worry that it is, indeed, an oncoming train. Anyhoo, How to Be Single will be gone in a flash, a lite belch with no aftertaste. It was, at most, a Valentine affair anyway, and now that February 14th has come and gone, so too will the sentiment. Soon enough, we’ll find ourselves in the March-April Dry Spell, typically the two bleakest movie months of any given year, a proverbial Death Valley between Oscar contention and May action, and the season which usually dredges up flicks by the likes of Liam Neeson, Nicolas Cage, and Selena Gomez. To survive, keep your eyes on May. It's always prettier come spring.